This Wednesday marks the 48th day after Ashura. Ashura is well-known because of its historical significance and mourning for the martyrdom of Imam Hussain, the grandson of Prophet Muhammad. Shia Muslims start the mourning from Ashura, the 10th of Muharram (1st month of the Muslim calendar) and continue for 48 days. Now, like many other cultural and religious festivals in Iran there are special foods and desserts that are served and offered to neighbors and friends during these 48 days. But before I get to the recipe for this dessert, I need to give you a little introduction to the Iranian tradition of pledging. 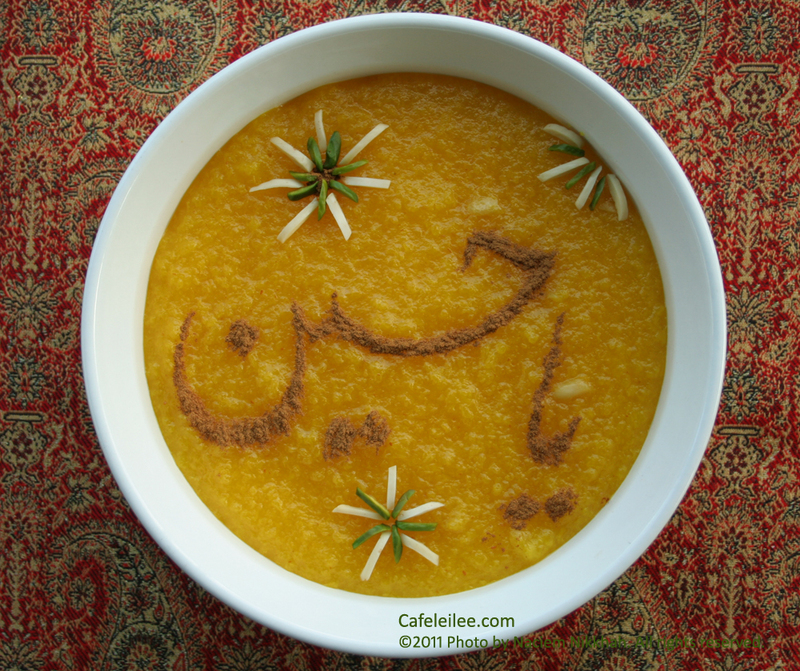 In Iranian Shia culture, if anyone has a wish, a wish that is really significant, like wishing for an ill relative to survive, this person will make a vow, that should their wish becomes true, they would make a certain dish each year during Ramadhan or Muharram and offer it to friends, relatives, and neighbors for as long as they live. These pledges, serve as a beautiful reminder of the miracle and joy of life. During my childhood in Iran, I loved these special days and months. Just imagine the thrill of sitting in your home, watching TV, and all of a sudden you hear a knock on the door, when you open the door you find your neighbor holding a beautifully garnished dish of adas polow, khoresh gheimeh or sholehzard. Fortunately for us, we now live in a very friendly neighborhood, where regardless of the time of the year we receive a plate of chocolate chip cookies from a neighbor who wants to welcome my sister to the US, or a pie dish from neighbors who want to give us the good news of becoming parents, or the richly flavored Indonesian dishes by a neighbor who shares the same passion for home cooked meals as we do. This recipe is also my submission to the A.W.E.D event hosted by Sweet Artichoke featuring Iranian cuisine. Wash and rinse the rice 2 to 3 times. In a medium size saucepan, let the rice soak in 4 cups of water for at least 1 hour (preferably overnight). After the rice has been soaked, bring the water to a boil, add sugar and reduce to a low simmer , covered. Let the rice cook and absorb most of the water for about 1 hour, stirring occasionally, until it reaches a thick consistency. Add saffron, butter, and rosewater. Let it simmer for about 10 more minutes. Add slivered almonds and stir to combine. Dish up in one medium size bowl, or individual bowls. Let it cool slightly then decorate with cinnamon, slivered pistachios and almonds. امسال از اول محرم تا حالا میخواستم شله زرد درست کنم که بالاخره درست قبل از چهل و هشتم به خودم اومدم و ترتیبش رو دادم. وقتی اومدم آمریکا جزو اولین چیزهایی که دلم رو تنگ ایران میکرد نذری هایی بود که همسایه ها ناگهان و غیر منتظره برامون میاوردن. تا اینکه به این همسایگی فعلیمون کوچ کردیم و همسایه های خوبمون به مناسبت های مختلف ما رو شرمنده میکنن و برامون غذا و شیرینی میارن. مثل وقتی که یک همسایه به بهانه خوش آمد گویی به دستیار آشپز (خواهر کوچیکه) به آمریکا برامون شیرینی شکلاتی آورد، یا همسایه های دیگه ای که برای دادن خبر خوش بچه دار شدنشون برامون پای آوردن، و همسایه ای که غذاهای خوشمزه اندونزیش نشون دهنده عشق و علاقه ی مشترکش با ما به غذاهای اصیل هست. خلاصه درسته که هیچ چیزی جای آش، عدس پلو، یا شله زرد نذری ایران رو نمیگیره، اما گرمی و مهربانی آدم ها یک چیز جهانیه. توی یک ظرف لعابی برنج را با همان آب به جوش بیاورید، شکر را اضافه کنید و حرارت را کم کنید و در قابلمه را بگذارید تا آرام آرام قل بخورد. بگذارید برنج آب را جذب کند و کاملا بپزد و شله حالت فرنی را بگیرد (حدود ۱ ساعت). در این مدت هر از چند گاهی برنج را هم بزنید تا ته نگیرد. زعفران، کره، و گلاب را اضافه کنید و بگذارید ۱۰ دقیقه دیگر قل بخورد. خلال بادام را اضافه کنید، شله زرد را هم بزنید و در کاسه دلخواه بریزید. بگذارید شله کمی خنک شود، سپس با دارچین و خلال بادام و پسته روی شله زرد را تزیین کنید. So thrilled to discover your blog, which I have bookmarked! Iranian cuisine is my top three favorite and I love to know more and more about it! Great dessert! I clicked here from arichoke's blog because I couldnt resist such a gorgeous photo! Thanks for sharing about the tradition as well. I have often heard of people pledging to give up something, but this puts such a positive light on sharing the memory each year.